Home beauty dailythings Diet DIY fitness Food Girls Guys Health & Wellness Health and Wellness Interesting knowledge lybrate Nutritions recent slider Ingredients That Never Let Your TEETH Turn Yellow! Ingredients That Never Let Your TEETH Turn Yellow! Stained or yellow teeth are very common and may persist for a long time, despite proper brushing, because of certain habits such as drinking tea, coffee or smoking frequently. The good thing is you can get rid of yellow teeth naturally. 1. Use a scrub made of strawberry, baking soda and salt. Enriched with vitamin C, strawberries help in the breakdown of plaque, resulting in whiter teeth. Moreover, the presence of an enzyme known as malic acid in strawberries, make them natural teeth stain removers. The salt generally performs the function of the scrub to remove the gunk that causes staining. Directions: Mix 2/3 large strawberries (mashed) with ½ teaspoon of baking soda and a pinch of sea salt. Use a paper towel to dry your teeth and apply the mixture on them with a toothbrush. Leave on for about 5 minutes and then rinse your mouth with water. Repeat every night. Being mildly abrasive, baking soda acts as an effective scrub and eliminator of stains from your teeth’s surface. Lemon juice is known to have natural bleaching properties, which make the mixture perfect for giving you sparkling teeth. Directions: Make a paste using few teaspoons of baking soda and the requisite amount of lemon juice. Ensure that your teeth are free from saliva and then use a toothbrush to apply the paste on your teeth. Rinse your teeth properly with water after a minute. Coconut oil contains lauric acid,which helps get rid of bacteria present in plaque, the ones that are responsible for the yellowing of teeth. 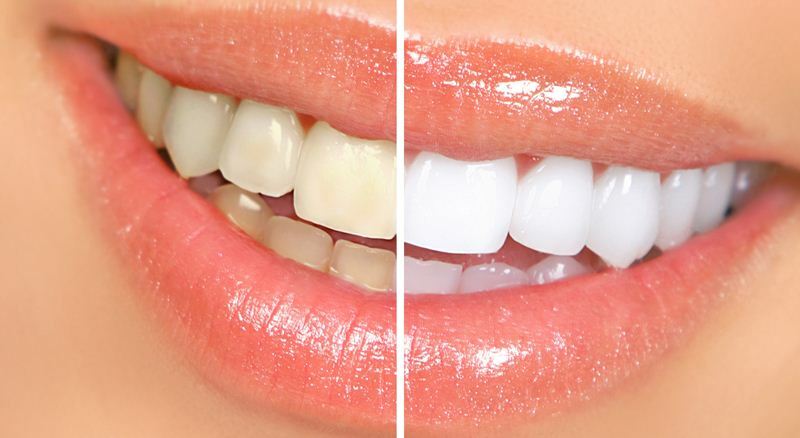 Elimination of the bacteria will remove plaque and give you whiter teeth. Directions: Swish 1 tablespoon of coconut oil through and around your teeth. Continue for 10-15 minutes and then spit it out. Use water to rinse your mouth and then brush your teeth. Repeat every morning for visible results within a few days. Sea salt is known for its exceptional cleansing and exfoliating properties, which makes it a highly effective remedy to curb yellowing or discoloration of teeth. Directions: Top your regular toothpaste with a pinch of salt before brushing. Alternatively, you can also brush your teeth only with salt once every week to get whiter teeth. Neem bark is considered to be an elixir of oral health due to its anti-microbial properties. In fact, neem has been used for cleaning teeth in India since ancient times. Directions: Soak the tip of a neem stick in water overnight. Take out the topmost woody layer of the stick in the morning. Brush your stick using this stick and rinse your mouth with water afterwards. CAUTION: However, these are not permanent cures and plaque build-up can recur due to your eating and drinking habits. For a long lasting cure, you could go for a professional teeth-whitening session at a dentist’s clinic.